Upon first seeing this pen and turning it over in my hand as all pen enthusiasts tend to do, I wasn’t sure exactly how much use it would see in the grand scheme of my pen usage. It soon became clear the answer to that question was a lot more than I’d envisaged on that first impression. I have a certain fondness for uniformly cylindrical or straight-barrelled pens, the origin of which I’m a little unclear on, though it is present nonetheless. Perhaps it is the variety in appearance from the usual tapered, cigar-shaped form, or perhaps there is some suitability to my grip and writing style. Further consideration and rumination about such things in preparing this post brings me to the conclusion both are relevant, however I suspect it is more likely form rather than function. The Faber-Castell Ambition OpArt is another addition to this subset of pens, and became regularly inked over the subsequent months. I’ve touched on the form factor a little above, however it bears repeating here. Of course I do enjoy the aesthetics and feel of my tapered pens as well, however find those uniform in diameter end to end pleasing to look at, and comfortable enough during use. As you can see from the images, the Ambition carries such a form factor, as does the Lamy Pur, which I wrote about a little while ago. In the case of the Ambition, to accommodate the cap within this style creates both a substantial step down to the grip section, and a very short section once there. In this particular case the step transition is low enough on the pen (due to the very short section) not to worry me. If your particular grip style results in finger placement further down the barrel, there may be an issue. Alternatively, and again depending on your preference, this may provide a means of grip stability or a balance point, which I find occurs with the step on the section of a Pilot Metropolitan. The overall diameter of the pen is not overly large, giving the impression of more length than there probably is, which incidentally measures 12 centimetres when uncapped, and almost 14 with the cap on (an identical length to a capped Lamy Safari for reference). The overall feel in the hand is one of lightness and even balance, which is unlikely to lead to any undue hand fatigue. Post the cap however and that is another story — more on this below. 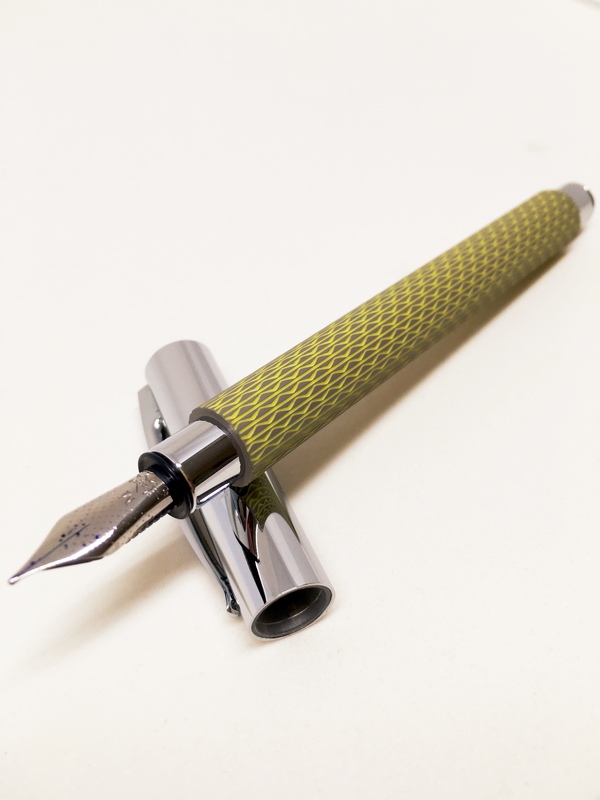 The chrome-plated cap and bridge-shaped clip are certainly sturdy enough, and being on the shorter end of the spectrum suit the overall look of the pen. The cap fits flush with the barrel to create the appearance of one smooth form, contrasted only by the colour and texture of the barrel. Speaking of which, it is in the guilloche texturing of the barrel which really gives this pen its character. The green colour you see here is listed on the Faber-Castell Australian site as the OpArt Curry edition. Though understandable, in the context of the some of the other colour names like Blue Ocean and Black Sand — it is a somewhat curious choice. 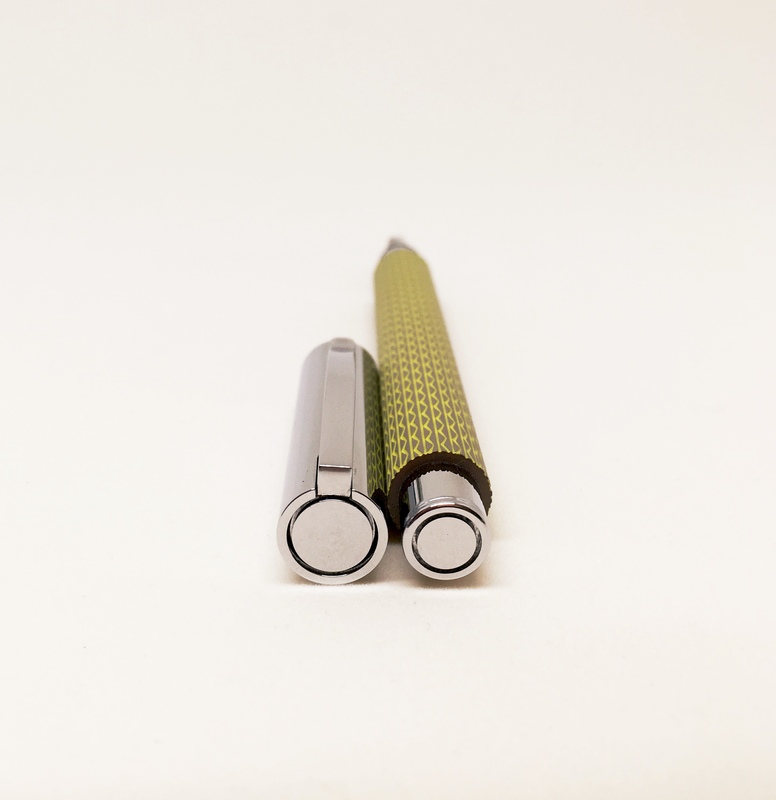 The design of the pen gives the appearance the chrome-plated posting knob and section run continuously through the centre of the pen, however of course these are merely fixed to either end of the resin barrel, which ensures the overall weight remains low. In the case of the section, a threaded attachment allows access to the cartridge or converter. 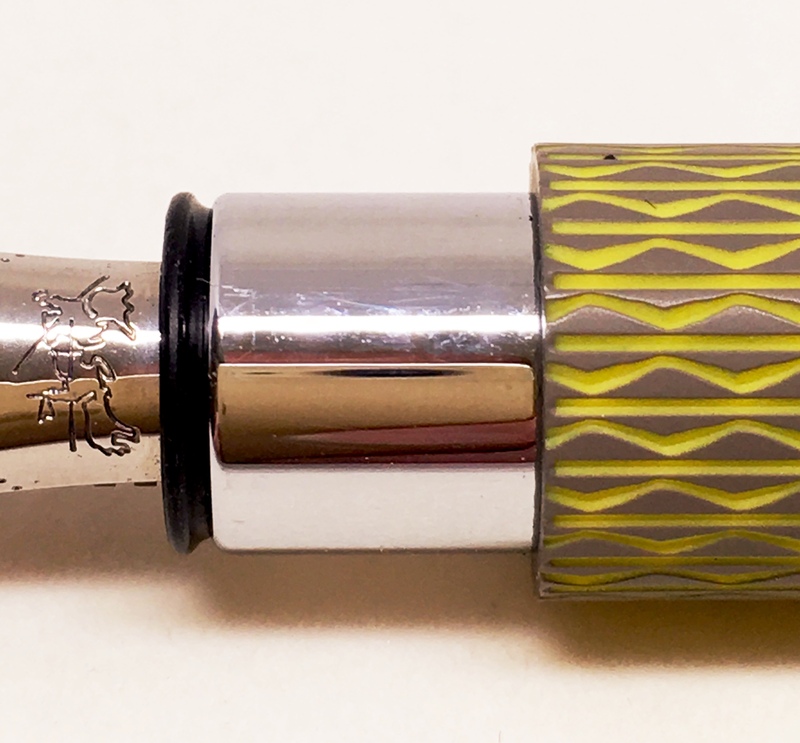 Uncapped, the barrel is bookended by the chrome-plated posting knob and very small section — both of which are proportional in size. With the cap posted, you have a perfect mirror of the capped symmetry of the pen, with the exception of the exposed nib ready for use. The section flows on to the stainless steel nib, which has an attractive pinhole dot patterning, and although not overly elaborate — suits me fine. Length: 138mm capped, 120mm uncapped, 156mm posted. As noted above, the Ambition uses a standard international cartridge, or Faber-Castell converter. As is often the case, other converters are likely to fit, however I haven’t specifically tested this. My local pen stores Pen & Ink (AU$145.00) and The Pen Shoppe (AU$135.00) also have some listings. I would note the quoted prices here are for slightly different finishes, and can approach AU$300.00 for the Coconut Wood model for example. 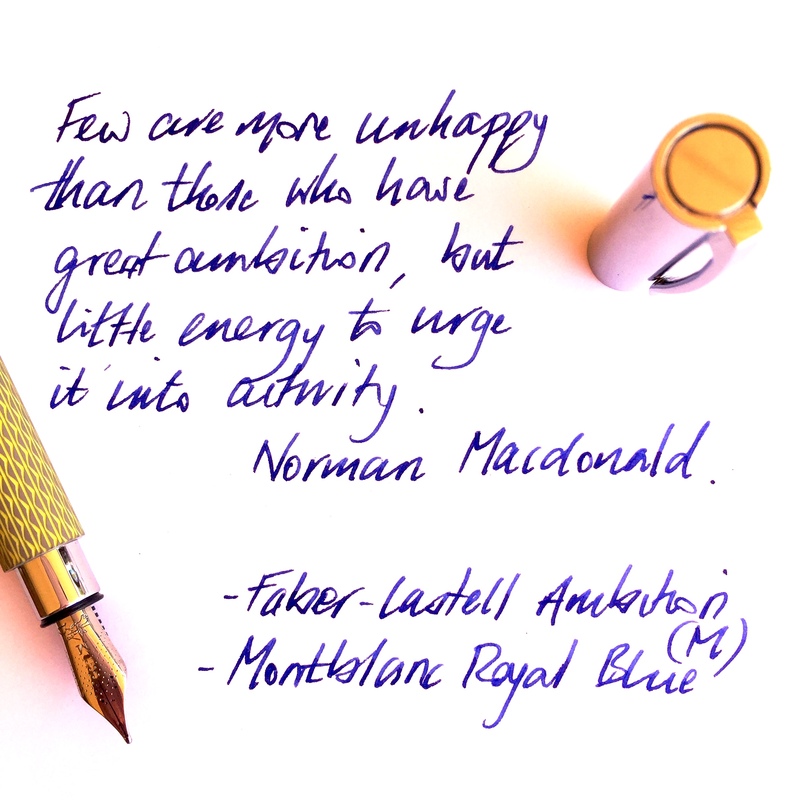 The Ambition comes with a stainless steel nib, and it is a beauty. Equal to any of the other steel nibs in my collection, and better than many. Being stainless steel, you expect a reasonably firm nib, and is certainly what you find here. A little pressure will provide some give, however a good deal of pressure is required for a minimal amount of line variation, and of course if that is what you are after this pen wouldn’t be high on your shopping list anyway. The medium nib on the model I own is as smooth as they come, and I don’t believe I’ve seen a single line of a single letter ever skip — from the first stroke onward. Depending on your individual style, the firmness of the nib may dig in a little on softer paper, however with the medium nib I’ve not had any problems across a broad range from office copy paper through to Rhodia or Tomoe River. 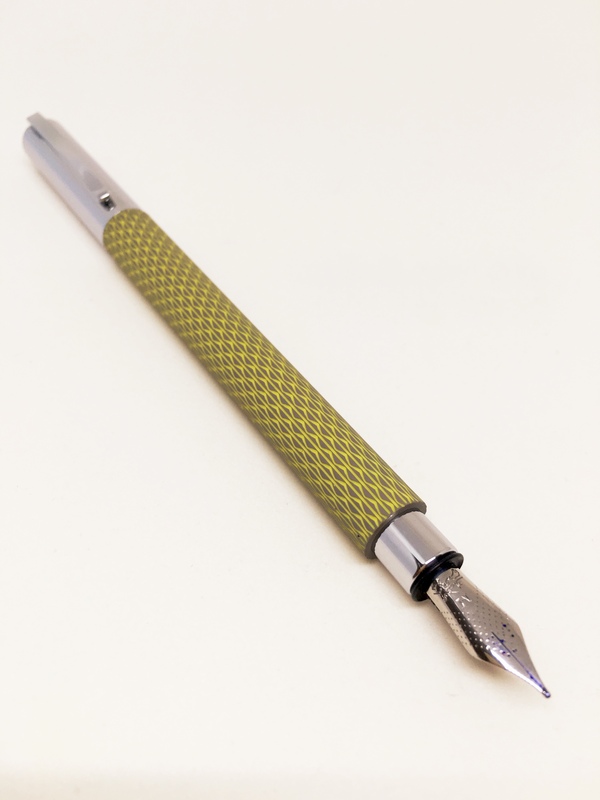 The nib is not what you’d call spectacular in appearance, sporting a very small Faber-Castell two jousting knights logo and series of pinholes patterned in V-shaped alignment with the nib, rather than a single breather hole. Finishing things off is the M nib width designation. Although not a large nib, it is a little longer for its size than some of my others, which suits the overall balance of the pen when writing. As I’ve mentioned, the very short section on the pen will, for many, necessitate a grip above this point a little further up the barrel. The length of the nib assists the balance of this arrangement by providing a little extra reach towards the page. I do not typically post many of my pens, and I would think the weight of the cap will likely prevent that with the Ambition, even if posting was your usual preference. Once posted, the pen’s centre of gravity is shifted to the join between the cap and the barrel, which is very high, and well above the webspace of your hand. Upon writing this way it almost feels as though the nib constantly wants to lift off the page. Comparing the weight of the cap in one hand and the pen in the other, the two feel reasonably similar, and upon checking, the cap itself weighs in at over 14 grams. Perhaps not astounding in itself, however if we refer back to the specifications above, the entire pen is listed as 28 grams (I make it 27 however you get the idea)! That is over 50% of the entire weight in the cap alone (many of my other pens are around 30-40%). Although considerable, it is not surprising given the dramatic change in balance when posted — which I would not really think is an option unless you have fairly large hands. Over longer writing sessions, the Ambition is probably not quite as comfortable as some larger diameter pens with a tapered form, however here I am referring to a three or four A4 pages before I began to have those thoughts. As a result, I found most use occurred with tasks such as outlining a post over two or three A5 pages, or using a coloured ink to mark up printed documents and the like. For longer conference call note taking or handwritten first drafts, the level of hand fatigue I’d say was probably a little higher than some of my other pens. Of course that is exactly why I have more than one — and I’m happy this is one of them. How to sum things up with the Faber-Castell Ambition? Overall, it is a well-balanced (sans posting) pen with one of the smoothest stainless steel nibs I own, housed in an unusual and eye-catching finish. I’m quite find of the uniformity in the cylindrical form of the pen, and have no problem with the shortness of the section when it comes to writing. 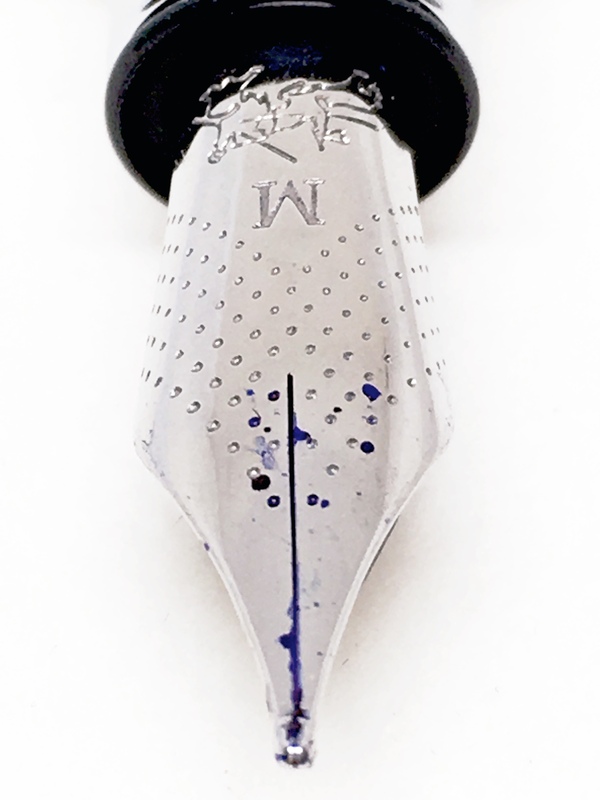 If you are perhaps hesitant to spend in the mid one hundreds, I wouldn’t be concerned in relation to the nib. If the design suits your taste, I’m sure you’ll find the nib an absolute bargain given its performance. A great combination of attractive form and superb function, though as always, particularly if you have concerns about that section — always best to try before you buy (often difficult I know). I personally found it better for short to medium length writing sessions, and will be happy to pick it up often for such occasions in the future. Now, I’m off to do other things — I have ambition you know. 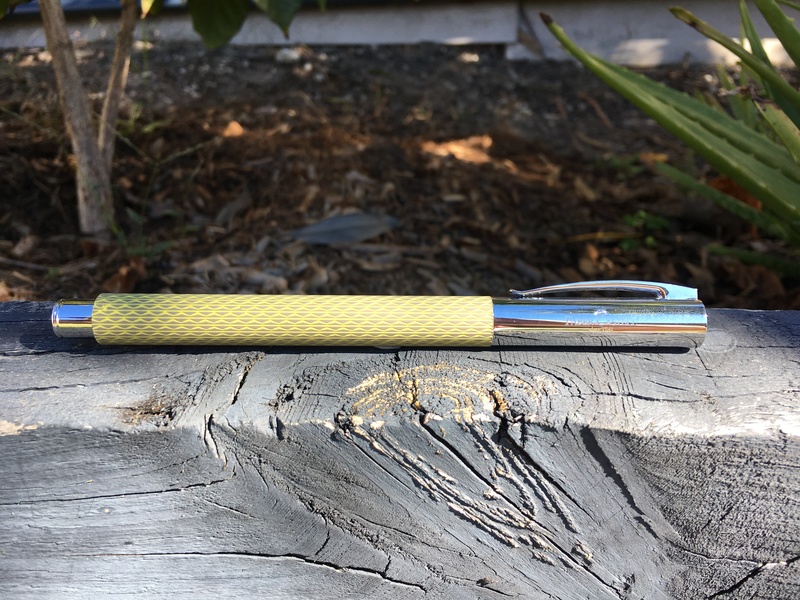 I agree that the guilloche texturing of the barrel gives this pen its character – I used to have Ambition in Coconut wood and it was lovely pen. I used it intensively for quite some time and than one day due to some neurological accident I’ve decided to sell it. I wish I hadn’t, really. Oh no! Interestingly, in doing a little research for the post I did look at the Coconut wood version with some envy!